Come Sailing With Us In Philadelphia! Thanks for stopping by to find out more about sailing with us in the Greater Philadelphia area! Staying close to home, our members can go sailing without making a road trip; and YES, there’s good sailing to be had in Philadelphia! Not only that, you’ll find many of the city’s exciting restaurants, cultural offerings and historical treasures just a couple of blocks away from where the boats are moored! Imagine hopping into the car after work on a weekday evening so that you can head to the boat to get in a mid-week escape; sailing along the exciting and beautiful Philadelphia waterway! As soon as you clear the breakwater you’ll be able to raise the sails for a fantastic cruise along our historic waterfront. Whether you want to learn to sail, be part of a crew, skipper the boat on your own, or get out on the water for a Captained Charter, we’ve got a solution for you! 1. We’re filling up our memberships for the 2019 season. To grab one of the remaining spots, take advantage of the current 50% discount off of the Orientation fee! This savings will only be available until March 1st, 2019 so contact us to secure your spot as soon as possible. 2. In season, our boats are located on the waterfront at Penn’s Landing Marina in downtown Philadelphia! This exciting and convenient location is in the heart of all of the great activities that regularly occur on the waterfront. Steps away is Spruce Street Harbor Park, the Independence Seaport Museum and the boardwalk style Summerfest too! 3. There are several options to sail with us for the 2019 season! We have openings on Beneteau Oceanis 37 andalso on our Beneteau Oceanis 41 tri-cabin. Call 866-724-5101 to find out more and to reserve one of the remaining spots! 4. Our sailing school calendar 2019 has been posted! As an ASA school we offer “beginner’s” courses through more advanced, multi-day, live-aboard courses. Plus, we can customize a class for your group! Click here or give us a call for the details or to sign up for a course. 5. We are interested in expanding our base’s fleet. If you’re interested in a purchasing a new Beneteau or Jeanneau sailboat and would like the boat professionally managed and have the insurance, slip fees and regular maintenance costs covered, plus receive a regular payment for us to use the boat in our program get in touch with us to find out more. You’ll also have regular use of your boat too! We now offer even more flexibility to meet our members needs. Or if you’d prefer to gain some time as crew to gain additional experience and skill, while also sailing for fun under the guidance of a licensed USCG Captain/Instructor, our CrewTime option might be a good fit for you! Feel free to call 866-724-5101 if you have questions or want to schedule a meeting. The Delaware River offers an exciting challenge to satisfy every boater’s interest. There are many places to explore as you head north or south from the city. You can even make your way to the Chesapeake Bay by way of the C&D Canal. Imagine a sail before sunset, returning the boat to its slip, then hopping over a few blocks for a wonderful meal in downtown Philadelphia. Plus you can add sleeping on board to your evening’s adventure! You can plan a night like this; all for less than you’d spend for a night in a hotel in the city. Step aboard our vessels that are harbored right at the marina on Penn’s Landing . Our sailing area offers the excitement of sailing in a big city. Not only will you be able to raise the sails as soon as you clear the marina’s breakwater, you’ll also gain valuable experience by boating in our active port location. There’s so much to learn in our location plus all of the excitement of the great down-town atmosphere is only a few blocks away! 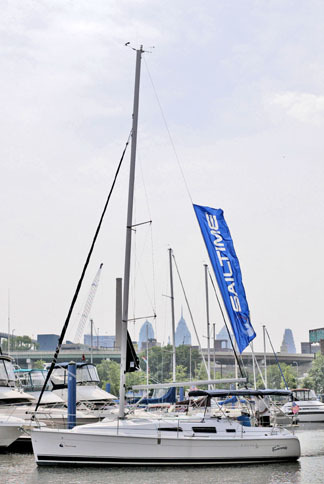 Become a fan of our SailTime Philadelphia Facebook page. Our sister base at the Jersey Shore offers memberships to sail the Barnegat Bay, launching from the Ocean Gate Yacht Basin. This can be your waterfront property for many adventures at the shore this summer. Located where Tom’s River joins the bay, you’ll be able to sail in a seashore atmosphere, anchor in a quiet harbor or even do a bit of crabbing to take a chance at catching your dinner for the evening. There are many spots to dock and dine or to grab a mooring ball. On Tom’s River enjoy the beautiful shoreline adorned with gingerbread style homes or keep yourself entertained by watching the match races put on by one of the regional yacht clubs. Check out the photos of our members having fun via our Facebook page. Join as a fan! To secure one of the open memberships give us a call – 866-SAIL101. Feel free to contact us with your questions! We’ll look forward to sailing with you soon.